If you own a Brittany, you know just how special these little pups are. Why not bring home a tile that reminds you of the special pup in your life? Incorporate this adorable 4 Inch tile in any tile installation project like the proud Brittany owner you are! The Brittany Spaniel 4 Inch Tile is hand crafted of stoneware clay for beauty and durability. The tile is hand carved, cast and finished by Fire Creek Clay, so please allow 4-6 weeks delivery. Why choose boring box store tile when you can have something that is custom and as unique as you? Choose Fire Creek Tiles today! Brittany Spaniel pups are know for their intelligence and their quirkiness. They are loving, loyal and hold a special place in the hearts of their owners. 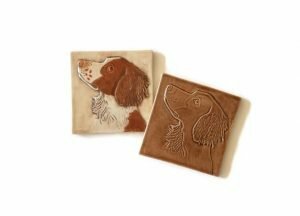 The 4 inch Brittany Spaniel Ceramic Tile is a way to honor this special breed. Hand carved and cast using heavily grogged stoneware clay makes this tile durable for installation anywhere in your home. This listing is for the Brittany tile glazed in a beautiful Camel glaze. Every tile starts as a slab of clay, hand craved and cast in plaster. Take a moment to read about our tile process HERE. We have several glazes in our shop for you to choose from. A variety of glazes to complement any tile installation and décor. Fire Creek crafts every tile from stoneware clay for beauty and durability. At 1/4 of an inch thick, our tile pairs easily with natural stone, commercial tile and Fire Creek field tile. We can help you achieve the look of your dreams. Do you still have questions? You can find answers to our frequently asked questions HERE. You don’t have to have the same tile that your neighbors have. Choose tile that is meaningful to you. Bring home Fire Creek Tiles today!